Drew Angerer/Getty ImagesFlorida Governor Rick Scott pauses during a press conference on South Orange Avenue down the street from Pulse Nightclub, June 13, 2016 in Orlando, Florida. Florida Gov. 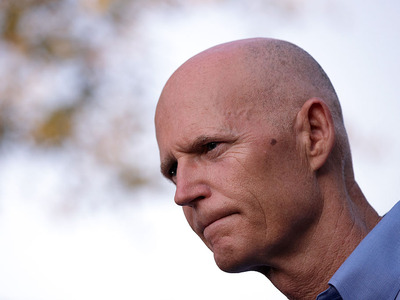 Rick Scott said Tuesday that President Barack Obama has not called him after the worst terror attack on US soil since the September 11, 2001, attacks took place in his home state. A lone gunman who pledged allegiance to ISIS carried out the deadliest mass shooting in US history early Sunday morning when he opened fire at the Pulse nightclub early Sunday morning. At least 49 people were killed in the attack. It’s typically commonplace for the president to call the governor of a state after such catastrophic events. Presumptive Republican nominee for president Donald Trump also phoned him, Scott said. “He called. He called to just ask how I was doing, say you know like everybody else is praying for us,” Scott said. The White House did not immediately respond to a request for comment Tuesday afternoon from Business Insider.